In a previous post of this vein, I also mentioned that I am currently researching and working on an article about our first three United States Presidents, George Washington, John Adams, and Thomas Jefferson, whom I believe were bird hunters to some extent. The name of the article will be “A Presidential Pursuit.” I’ve found some firsthand evidence that supports my thesis and I believe most people are not familiar with this information. It should be an interesting read. I hope to get this article published soon and I will keep you up to date on its status. Thomas Jefferson: Turkey Hunter Extraordinaire. A story was told of how Thomas Jefferson was given a gun when he was ten years old and instructed by his father to go into the woods and not come home until he had killed some game. Young Jefferson searched far and wide, but he had no luck in finding a suitable victim. Finally he stumbled across a wild turkey that was trapped in a pen. He tied the turkey to a tree with his garter, shot it, and then carried it home over his shoulder to lay at the feet of his proud parent. I’m not sure of the authors’ source for this story, but I got a kick out of it nonetheless. 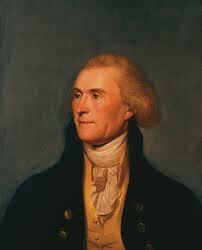 Nobody can acuse Jefferson of being stupid. In fact, during a dinner for the Nobel Prize winners in the White House in 1962, John F. Kennedy said that the honored guests were probably “the greatest concentration of talent and genius in this house except for perhaps those times when Thomas Jefferson ate alone.” Amen. Even as a child, we see this genius coming through–albeit a bit mischeviously. John James Audobon, Wild Turkey Painting. 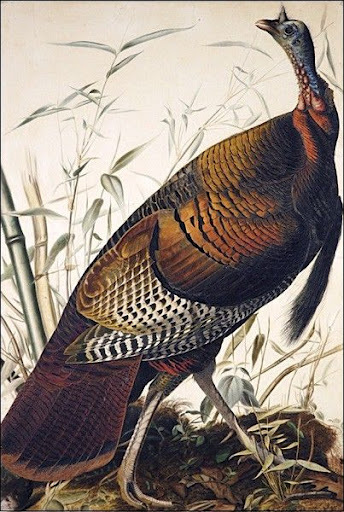 Believe it or not, Benjamin Franklin proposed that the wild turkey be designated as our national bird. No offense to the bald eagle, but I don’t think that was such a bad idea.